You know how when you once in a rare while hear a song that's so good you're convinced it's the best thing ever made, and never mind that it's probably not really; that feeling of exhilaration and amazement, of needing to play it again and again and making you want to tell everyone you know to check it out? That's what happened the first time I heard 'Kitni Haseen Hai Meri Pyar Ki Nazar'. Many will be familiar with Bollywood Funk; well this is Bollywood Punk and it is sensational. Raw, dirty, raunchy, sweaty; the surf rock intro, Asha sounding (and Helen looking) ooh so seductive, the Mariachi horns, the echo-drenched chorus, the gritty and distorted guitar sound; sparks flying! Absolutely amazing stuff. 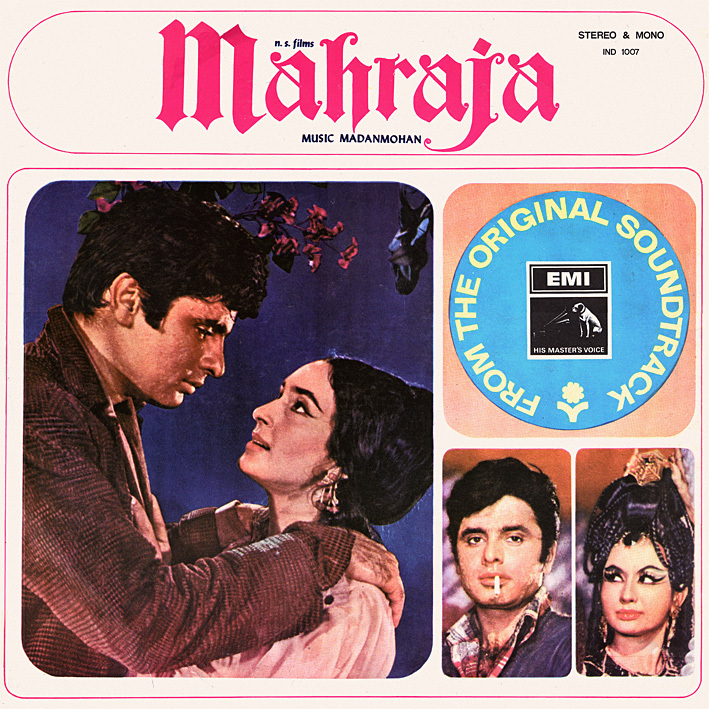 And while there's nothing that can measure up to such an opening track, 'Mahraja' contains more songs that would easily highlight other soundtrack albums. 'Tum Se Bichhar Kar Chain Kahan Hum Payen Gay' is sumptuous orchestral pop sung by Lata, 'Main Ne Pee Kee Mera Dil Kiya' is an upbeat, country-tinged drunk-song (Helen again looking irresistible in the film clip), and the traditional sounding 'Pee Kee Najar Gori Tanse Lipat Gayee' exudes a sense of wild urgency that inevitably draws you in. And in between there's an instrumental that sounds like old-school burlesque striptease music. You might need a shower after listening to this one. thanks for upload this movie songs. What? No I can't. Can you do my laundry for me? Used to be the comments section was a forum for exchanging opinions, views, insights etc; now it's increasingly becoming a case of "I want more, gimme." Hey buddy, don't let the idiot blog bots get you down -- just ignore 'em. You've still got real listeners out here! I really dig that first track and the burlesque style Dance Music is superb. Thanks for this and all the other brilliant gems you've shared over these past years. Kitni Haseen is great, yeah! I would like to point out that the long beginning guitar section of the song is an 'homage' to the classic surf instrumental "Pipeline". Thanks for this! It is yeah, but it's grittier and rawer than the Ventures original, plus the dialogue on top of it adds a new dimension. Not that I understand what they're talking about, it just sounds really cool. Thank you so much for sharing this rare album. Great Work PC, this album is known for song 'Tum Se Bichar Ke" a typical Lata - Madan Mohan song. There'll be much more Lata/Madan Mohan on the next post. love this one! thanks so much. really appreciate all of your postings, much obliged. Oh, by the way, you can send your laundry to my house anytime. Just noticed I've credited the Ventures as having the original 'Pipeline' a few comments above; it is of course the Chantays.